⚓ T56597 mesh + armature exported in FBX format (7.4 binary or 6.1 ASCII) and imported in NUKE 11 does not work well. 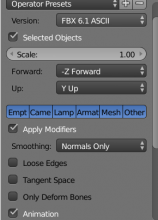 mesh + armature exported in FBX format (7.4 binary or 6.1 ASCII) and imported in NUKE 11 does not work well. If you create an armature with the rigging system that you want and and then you bind it to a character's mesh and then you export the mesh AND the armature to FBX 6.1 ASCII and then you import them in NUKE 11,it crashes a lot of time. Instead,if you export them to FBX 7.4 Binary,the mesh and the armature are not imported at all. mario (ziomario) renamed this task from mesh + armature exported in FBX format (7.4 binary or 6.1 ASCII) and imported in NJKE 11 does not work well. 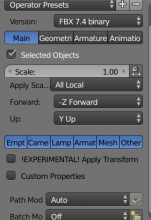 to mesh + armature exported in FBX format (7.4 binary or 6.1 ASCII) and imported in NUKE 11 does not work well..
ok for the armature,but not good for the mesh. Nuke should import correctly the FBX file format.both in 6.1 ASCII and in 7.4 binary format. If it does not do it correctly,it's a bug of blender. So,I suggest to re open this bug. And anyway,the question deserves to be deepened,not closed on two feets. You’ll have to give proof that issue is from Blender side, not from Nuke side first… afaik meshes are pretty reliable in our FBX io addon. Not our job to investigate that kind of issue, especially not with a closed-source software we don’t have access to. I think that it not necessary to look into the code as first thing to check. Maybe I used wrong configuration on the settings of the FBX panel,or it's necessary to use a "special" combination of settings,that I don't know. The best solution I think could be to make some attempts by the cross users,users who uses/know blender and nuke. I think that it worth trying before to close this post. If It was not strictly a bug,it was very close to be a bug,because each combination of setting should produce a different kind of effect,but since it could work only in some circumstances,it could be a bug. That’s the last time I say it: THIS BUGTRACKER IS NOT A USER SUPPORT SERVICE! I have other things to do than closing three times the same task because you cannot understand that this is not a valid bug report! Last warning, next time I’ll disable your account. ok. you are the coder.